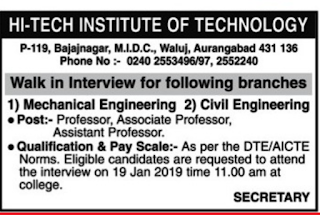 HI-Tech Institute of Technology,Aurangabad, Maharashtra has advertised for the recruitment of Teaching Faculty- Pofessor,Associate Professor,Assistant Professor jobs vacancies. 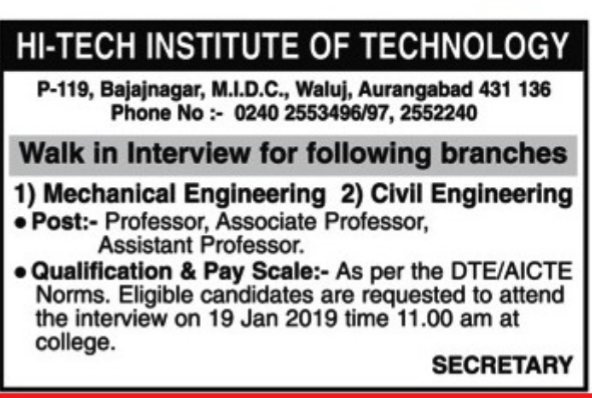 Interested and eligible job aspirants are requested to attend interview on 19th January 2019 11a.m at college. Check out further more details below. Name of the College: HI-Tech Institute of Technology,Aurangabad,Maharashtra. About College:Hi-Tech Institute of Technology (HIT) , Aurangabad, is established from the academic year 2001-2002 for imparting professional training in engineering discipline to the new generation. As per AICTE norms, Govt of Maharashtra and D.T.E Mumbai. Salary Package: As per AICTE norms,Govt of Maharastra,D.T.E Mumbai. How to Apply: Eligible candidates are requested to attend the interview on 19th January 2019, 11a.m at college.